Fiber Flux: Free Crochet Pattern...Candy Stripe Pencil Case! 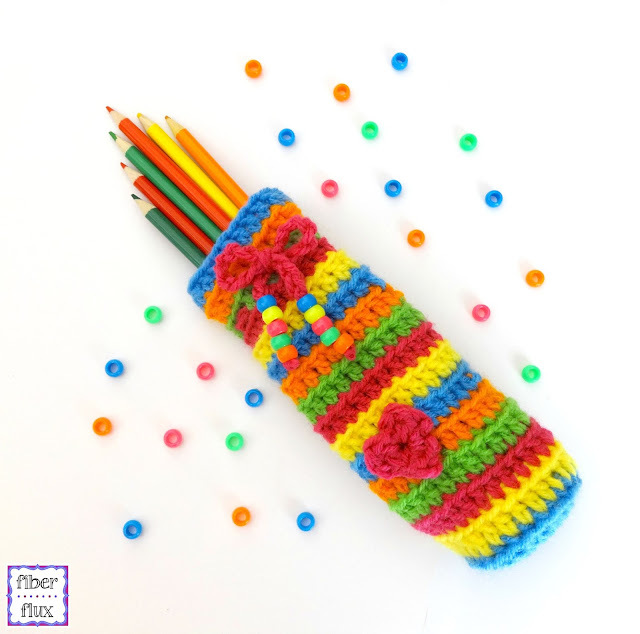 Free Crochet Pattern...Candy Stripe Pencil Case! 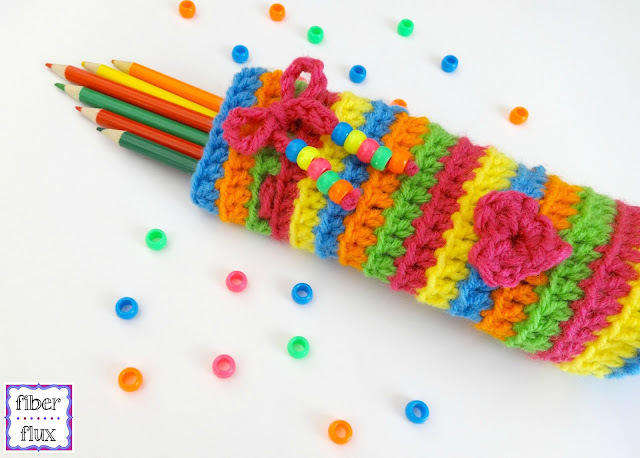 Here is a pretty and cheerful crochet pencil case that is super easy and fun to work up. Bright fun colors in vivid candy coated tones are finished off with a beaded tie closure. 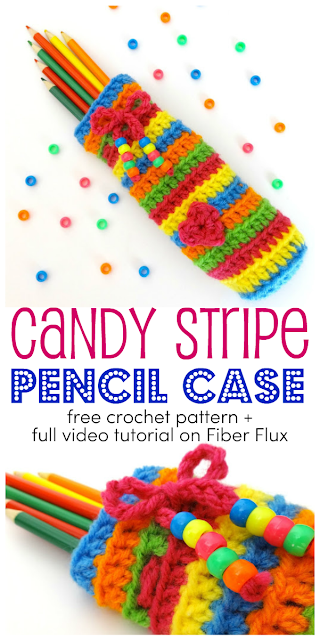 This is a perfect project for using up scrap yarn too! I simply love the idea of sending your little loves to school with something beautifully handmade to remind them throughout the day that someone cares for them. Need a little extra help? Check out the full video tutorial! Ch 4, join with a sl st to form ring. Round 1: Ch 4, then work 11 dc into the center of the ring, join to close round with a sl st. Round 2: Ch 3 and work a dc into the first st. Work a dc in each stitch, then join with a sl st to close round. Round 3: Ch 3, then work a dc in the blo (back loops only) in each st, join with a sl st to close round. Repeat round 3 until pencil case is a little taller than a pencil, or to desired height. Fasten off and weave in any ends. With any color yarn, make a chain 12 inches long and fasten off but don't weave in ends. Using a tapestry needle if needed, weave in the drawstring between stitches (the spaces in between the stitch posts) a few rounds down from the top edge all the way around the case. I threaded mine every three stitches or so. 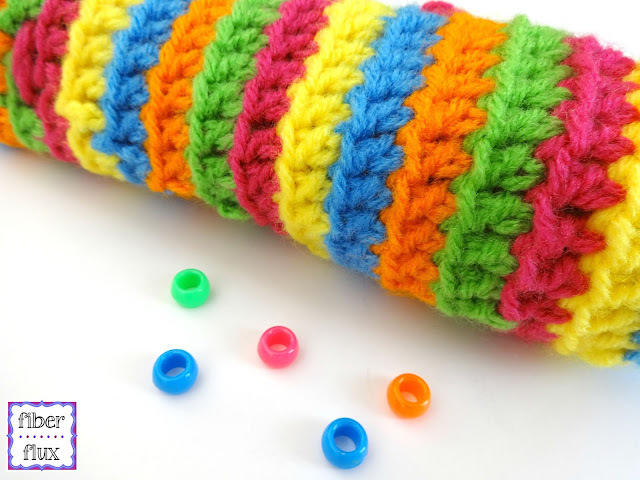 String a few beads onto the yarn tails on both sides and tie a knot at the bottom to secure. Trim and you're finished! If you'd like to add the heart applique shown in the picture, here's the free pattern for a one-round heart. Just use one of the colors from your project and the same size hook. Sew onto the pencil case with a tapestry needle. 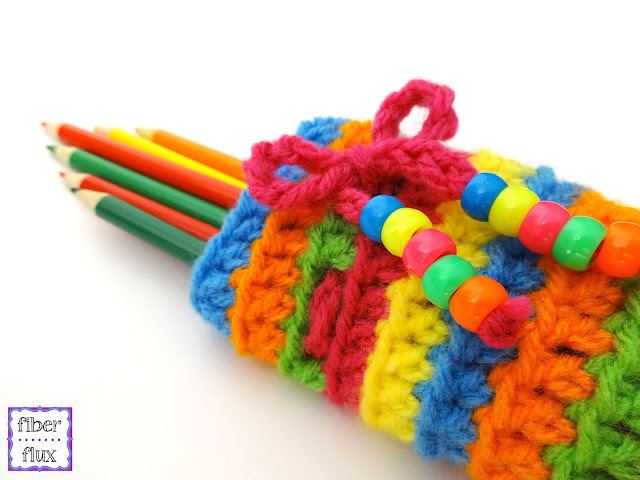 This is a cute pencil case; I could also put my crochet hooks in it as well, or make it longer for my tunisian crochet hooks!